Just as with all of our other products our Vertical blinds supply and installation service is controlled entirely in house, meaning the same outstanding quality found in all of our other curtain and blinds manifestations. 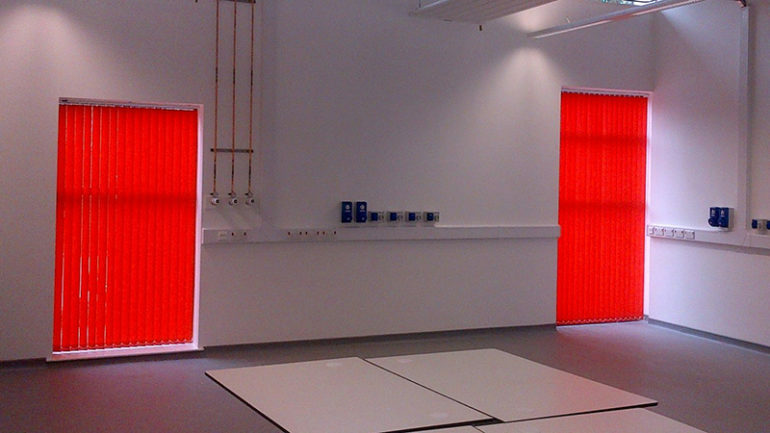 At Corona Contracts we offer a complete service for commercial blinds. From start to finish, our clients deal only with us, which we believe enables us to provide a much higher level of service and quality control during the creation and installation of our products. Every part of the service we provide is controlled by us, from our in house designers, to our in house manufacturing and assembly and finally to our installation team, also made up of full time Corona Contracts staff. Our vertical blinds supply and installation service offers our business customers some of the highest quality fit and finish blinds available anywhere. Our design team take a flexible approach. We can work with new or reclaimed commercial spaces, find the best fit for a refurbishment project or work with businesses who have a very clear idea of the look and feel they would like for the vertical blinds. We are sometimes asked to work with an existing team of architects or interior designers. All collaborative efforts will be handled with absolute professionalism on our part, having worked with businesses across a huge range of industries, we are happy to work with others to create the designs perfectly suited to our client’s locations. If our clients do not have designers of their own, but do have design preferences, we can pass this brief on to our design team. Our products are built to stand up to many years of commercial use, so we aim to match our vertical blinds to the existing look and feel of a premises wherever possible, including colour matching to sit well with existing business branding. At the design stage we factor in all functionality of the final product. For clients in educational or care industries, such as hospitals, school and nurseries, our anti-ligature systems are often required. These enable our vertical blinds to be safely operated without risk of strangulation for hanging chords. For those in the hospitality and entertainment industries, our blackout solutions might be the preferred option. The bespoke fit of our designs ensures perfect accuracy for complete blackout in use. Our automated systems are ideal to add a touch of class to an executive office, cinema or theatre. Remote control functionality allows unparalleled ease of use and top quality components from market leader Mottura ensure trouble free functionality for years to come. Our remote control vertical blinds systems are also idea for spaces in which access to windows for manual control is limited, for example in buildings with particularly high ceilings. When manufacturing vertical panel blinds our in house team draw on their extensive experience to create products to extremely high manufacturing standards. This is an integral part of our service since our commercial focussed products will need to stand up to a much higher level of wear and tear than regular domestic blinds. Having worked with world-leading component supplier Mottura for a number of years, our team are fully versed in the correct installation and use of these outstanding components. This is where we ensure our vertical blinds operate exactly as they should, with a smooth action and no hiccups. We stock a full range of different fabrics which we can implement in our vertical blinds systems. When clients express a preference in terms of material, colour or finish we will do all we can accommodate these requests. When working to more restrictive budgets our experienced team can offer practical advice on the most cost effective materials and finished to manufacture. Cost savings here will in no way affect the final performance of the vertical blinds, all of our products are manufactured to the same high standards. Part of our obligation when creating and installing blinds for commercial use is keeping to time scales and deadlines as set out in the contract. Restoration and construction projects are guaranteed not to be held up by our installation process. Our experienced fitters will ensure the highest standard of fitment and will, of course, leave any installation site fully cleaned and ready for operation after the fit has been completed. When working in commercial or public buildings our trained installation team will carry out full risk assessments where necessary to ensure to ensure safety and all times during installation. Having worked in hospitals, nursing homes and schools our customers can rest assured they we take our health and safety obligations extremely seriously. If our vertical blinds supply and installation service could address the needs of your business, please reach out to the team for a no obligation chat about how we can help. Whatever the budget of our clients, we’ll work closely with you to provide the light control solution you need at a price to suit.